Expedition Ready custom made expedition racks. The roof rack includes 2 rear ladders. Designed with full length side grab bars that can be used to store extra gear like Hi-lift jack. 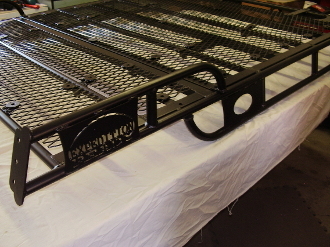 The rack includes a light bar fitted with light tabs for LED lights. Powder coated black. Custom colors available. Custom built to order turn around time is 4 weeks. We custom build to your spec. Includes a light bar fitted with light tabs.